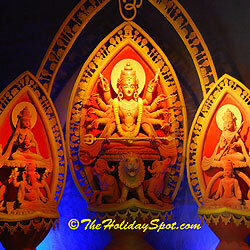 Durga puja is considered to be the staple festival of the people of Bengal and the Bengalis. It is the festival when every Bengali as well the people of Bengal deck themselves in the most fashionable attires and pledges to visit almost all that pandals that are set up at every nooks and corners of the state. Thus the celebration that the state adorns itself with is worth witnessing. So what are your plans for this Durga Puja? Check out how this festival is celebrated and then plan out accordingly and be the part and parcel of this celebration. And if you liked this article then do not forget to refer this page to your loved ones. Click here to send this page to near friends and loved ones. 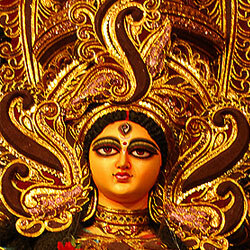 The celebrations of Durga Puja have always attracted devotees and cultural crowds from faraway places. The city of Kolkata is the destination for you during the Puja days if you are really interested and eager to witness the divine power and Bengali culture. However, the whole West Bengal feels the difference during those days of carnival. The celebration and its plans start long before the actual dates of the Puja. Garment shops and jewelers get busy in handling and managing large group of people who flock to the shops to buy clothes and ornaments for their near and dear ones. The five days long fiesta starts with Maha Shasti when the all important divine power, Devi Durga, comes and resides on the sanctified thrones of various mandapas and it is known as the bodhon of the deity. The festive time continues till Maha Dashami when all the idols are immersed. The occasion ends with sweets and greets. Everyone is blessed with prosperity and affluence. These joyful five days are spent with Bengali dance forms and music. The fun filled feeling spread across the religion and creed. Clear blue sky, enchanting mantras, aroma of Shiuli flowers, tune of Dhak (musical instrument) and pleasant weather; summarize the interesting and absorbing celebration. The celebrations have not lost its charm and charisma but the shades of colors and zeal have definitely changed over the years. Previously, it was a rich carnival which was predominantly and typically celebrated by the powerful individuals like kings, feudal lords and businessmen. The ritual and social celebrations of the festival have changed a lot as well. Age old drums have given way to loud and voluminous film songs. Even though the taste and the pattern of celebration have shifted from its purest and ancient forms but the moods of celebrations are still intact. The enthralling tunes of Dhak and vibrant dance forms are integrating parts of the fiesta. The social and spiritual significances are foremost and important. 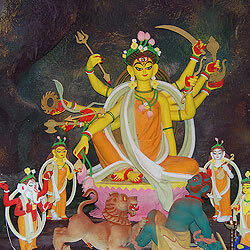 Cultural programs and various social activities take place in the pandals or mandapas. A lot of households also celebrate the occasion all over the world. Even though it is the greatest fiesta for Bengalis but all the people take part in the celebration. This is the essence of the carnival. Friends and relatives congregate on the premise of Puja and celebrate the occasion. The occasion truly has an innate power to bind and connect souls. Educational institutes, business firms and Government offices are closed during those days. The festive moods are prominently visible on the city dwellers. Well dressed people visit numerous pandals to watch the divine deity idols and the special decorations of those pandals. However, if you are interested to feel and watch the atmosphere around the city of Kolkata, you must visit the place during puja days to know it in details.